This is a very controversial and thought provoking read. The author is the Woodrow Wilson Professor Emeritus at Williams College (no relation) and is widely regarded as the most leading authority on the Ethics of Leadership. His previous 20 something books include the outstanding “Roosevelt: Soldier of Freedom” which won a Pulitzer Prize. I read it and found it most insightful- both as to the man and the politics surrounding him. This book begins with a 5 page Prologue which is so enticing you just have to read the book to see where he is going with it all. The biggest Court Packer in history was Roosevelt with his attempt to “stack” the court by adding 6 more judges. The idea was shot down and FDR had to find a new way to launch his NRA, which had been struck down by the court. He did so in the form of the WPA and other agencies. Mr. Burns proposes that due to the lifetime appointment of Justices to the Court, that there is a disconnect between what the country needs and what the Courts will allow. The NRA and Franklin Roosevelt are good examples. Sometimes change can take too long. He also questions the apparent lack of a Review of all legislation by the Court prior to something becoming the law of the land. He states that this lack of review amounts at times to a lifetime Veto which is in direct opposition to the Powers of Separation which make our country so unique. And remember, this is only the Prologue! The book goes on to review the various incarnations that the Court has taken over the 200 plus years that it has been in existence. At the end of the book he proposes changes to the Court and thus the Constitution, particularly Article 3, which outlines what the Founding Fathers thought prudent for a Supreme Court within the confines of a stable and workable government. The book is fascinating and is wide in scope. It may take another read to fully comprehend all of the information imparted here before I rush to judgment on it’s merits or flaws. I am no scholar. To add justices, or even have them elected to finite terms of office, appears to me as an attempt to politicize the Court as well as second guess what the Founding Fathers were trying to do when they left Supreme Court review of all legislation out of Article 3(This is Mr. Burns interpretation- not mine. )If I have learned anything of the history of this nation it is that the Founding Fathers aims can more often be discerned by a careful review of what they did not include rather than a focus on what they did include. 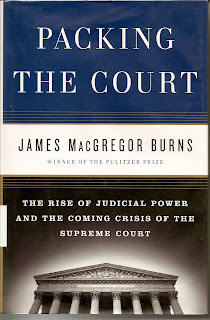 A very provocative read for anyone interested in the Supreme Court; where it has been and where it might be heading.